PickupHockey.com - Who's your Stanley Cup Champion in 2019? Who do you think will win the playoff championship in 2019? Well I would have chosen the Lightning but that's not going to happen now. I would believe someone if they said that CBJ would beat them in 7 (although I would have thought they were crazy to think it) but to sweep them in the first round. Inconceivable! I wasn't surprised CBJ beat TB, but was shocked they swept them! My prediction going into the series was TB in 7. Leading up to the playoffs I kept saying I didn't like the potential matchup if I was Tampa, and that if I was them I would be hoping for either Carolina or Montreal in the 1st round. CBJ are a very deep team up front with 7 players that scored at least 23 goals (6 of which scored 26+). Also some solid veterans like Foligno, Dubinsky, Jenner etc and you have very deep forward corps. A steady defence lead by superstar Seth Jones, and a 2-time Vezina winner between the pipes in Bobrovsky. Add in coach Tortorella's relentless style and they had all the makings of a dangerous playoff team. CBJ finished the regular season strong as well. The top 4 teams in the West are all gone, although I wouldn't say all of them were surprises. I had Dallas beating Nashville, and St Louis was a very tough matchup for the Jets to draw in the first round. I think most people were a little unsure what to expect from Calgary, but I for one expecting them to play more then 5 games! With the Rangers, Pens, and now Leafs gone...I don't know what bandwagon to jump on. I'd like to see Joe Thornton win a Cup. Wouldn't mind see Ovi and the Caps repeat if for no other reason than to further silence all the "how many Cups" critics! I'm hoping Dallas makes it to at least the 3rd round so that the conditional pick in this years draft in the Zuccarello trade becomes a 1st rounder (they could also get their 1st rounder in next years draft as well if Zuccarello signs with Dallas this summer). 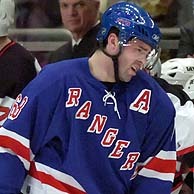 I also think I speak for all Rangers fans when I say I would love to see Zuuc win a Cup! And finally, I think CBJ winning it all would be quite a story!. Looks like I jumped the gun a bit...3 of the top 4 teams in the West are gone. SJ had a crazy comeback last night in the 3rd, so they are still alive!